A nationwide campaign to cut down on plastic carrier bags has reduced the number used in supermarkets by more than 3.5 billion per year. Thanks to a campaign involving seven major retailers in the UK, the number of carrier bags issued dropped by almost 50 per cent in 2009 – and retailers have promised even more cuts. Previously, around 13 billion carrier bags were used in Britain over a 12 month period and the problem of single-use bags was a major environmental concern. Most plastic carrier bags don’t degrade easily and some can take hundreds of years to break down in landfill. Carrier bags are also a source of pollution and pose a danger to both wildlife and marine life. Sadly, millions of single use carrier bags are still given to customers at the checkout every MONTH and environmentalists say much more still needs to be done. In the Irish Republic, for example, a mandatory charge for plastic carrier bags has reduced the number used in shops by an incredible 90 per cent and Marks & Spencer has reported that a small charge it introduced for single use carrier bags has led to substantial reductions. 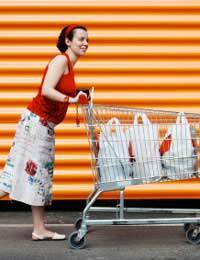 In 2008 the government warned that unless retailers could radically reduce the number of bags being handed out to customers it would introduce a mandatory charge for each bag issued. This led to the reduction campaign involving major supermarkets like Tesco, Asda, Co-op and Waitrose. Some stores also brought in a range of additional measures to cut down on the number of carrier bags being given out such as offering bonus points on loyalty cards to shoppers providing their own bags. Environmentalists welcomed the campaign but believe that even bigger reductions are possible. They want the reduction campaign to be taken up by all retailers – including clothes and specialist stores - and not just confined to food outlets. As well as encouraging customers to re-use their carrier bags, many stores are now sourcing carrier bags made from 30 per cent recycled material and virtually all major stores now offer Fairtrade or re-usable fabric bags at a discount price. But latest figures show that while almost half of shoppers say they have a reusable bag, less than 15 per cent remember to take it shopping with them! And remember, many large supermarkets now offer recycling points for single-use carrier bags. This means that if you do have to ask for a carrier bag, you can at least recycle it on your next shopping trip!